"One of the things you might encounter after upgrading your computer or starting a new computer for the first time is the amount of stuff that might make the operating system start a little groggy at first. This article will show you some of the common tasks you can do to speed up that old computer or squeeze as much performance as possible out of that [Windows 7] PC." The good folks at Notebooks.com have written a three-part (thus far!) series on making Windows 7 "even faster." 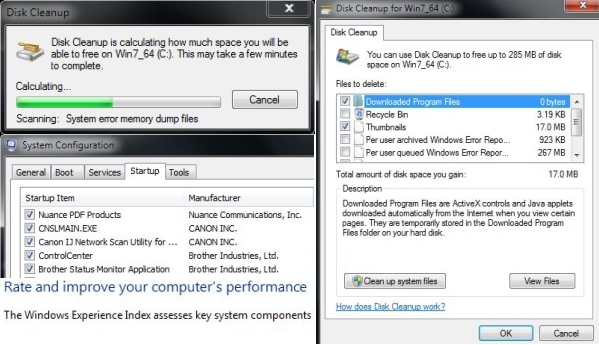 Starting with Disk Cleanup, the series sticks to the utilities and settings that are available within Windows 7 itself, and touches upon such topics as System Protection (Restore), Performance Tools, Indexing, and Startup Performance. The articles are a good starting point, and the suggestions should be safe, easily undone, and, of course, are all available without cost, other than one's time. It is possible that the series is not yet complete, but a couple of minor gripes thus far are that the author's list of Startup recommendations is based upon the programs running on one particular system, no mention is made of deactivating Windows Services, or of the potential advantages of File and Disk optimization (defragmentation and partitioning). What are your favorite methods of speeding up Windows (free, or at relatively low cost)? Do you use third-party utilities, or stick with the one's Microsoft builds in?